Video Cube was developed by Aris Multimedia Entertainment, a company that, based on the list of products they included with Video Cube, had up to that point mainly sold CD-ROMs of stock videos. It’s unclear if they were actually successful. (I’m guessing not.) But when the game came out in 1993, watching a video on your computer was a new concept, exciting enough that a company like Aris could try to sell CDs of video clips. It was an amazing feature at the time, and combined with a trendy interest in pop-art video, that’s the best reason I can imagine why Video Cube exists. The video cube is “an object of unknown (but definitely extra-terrestrial) origin” floating through space. 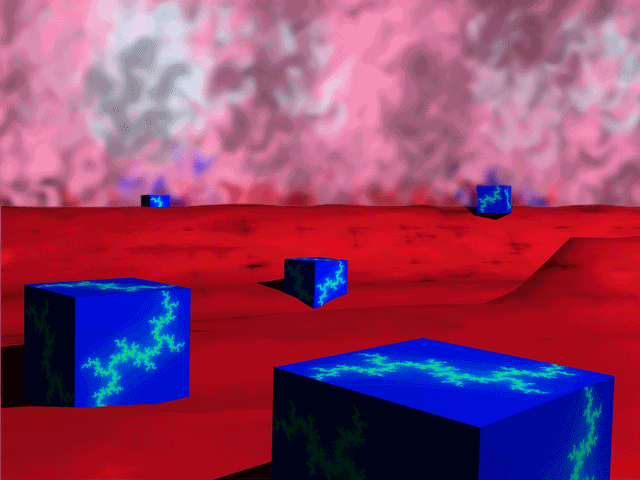 It’s outstandingly cheesy, and yes, you get to watch videos of the cube hurtling through space like the Borg from Star Trek, entering wormholes, and exploding out of supernovas. Between levels, you even get to visit the cube planet! More cubes are jutting out of the landscape, although no word about whether they’re also video cubes or just regular type. The cube is made up of dozens of smaller cubes, each side showing a different image from a video about space. It looks like a cross between a Rubik’s cube and a video wall from an early 90s TV show. The goal is to flip them around to reveal all six pictures, one at a time, before the clock runs out. It isn’t a particularly interesting puzzle, just taxing, and tons of clicking. The fun part is that when you solve the puzzle, the video plays, along with totally radical rock music. This was still the early days for video on computers, and that came with a lot of limitations. Everything was being read slowly from a CD-ROM, and a computer from 1993 only had the speed to display and load so much video at once. So the use of video is limited and heavily compressed. You do still get the full video clips as rewards, and maybe that was cool enough in 1993. But it’s so disappointing that most of the game is low-quality, inscrutable pictures instead of awesome videos of spaceships and planets. There’s understandable technical reasons why the video cube couldn’t have footage playing on it all the time, but everything about the game – from the 80s TV-inspired fonts and alien space-rock aesthetic to the gnarly box art – suggests it’ll be more dynamic than that. The game does what it can. The animated backgrounds help convey motion, and the clock and the ominous background noise build tension. No matter what else it does, it can’t get over the dull-looking cube in the center of the screen. 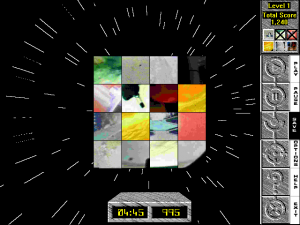 Computers in the early 90s could now support videos well enough for a stock video CD-ROM, but not enough yet for an interactive mosaic. 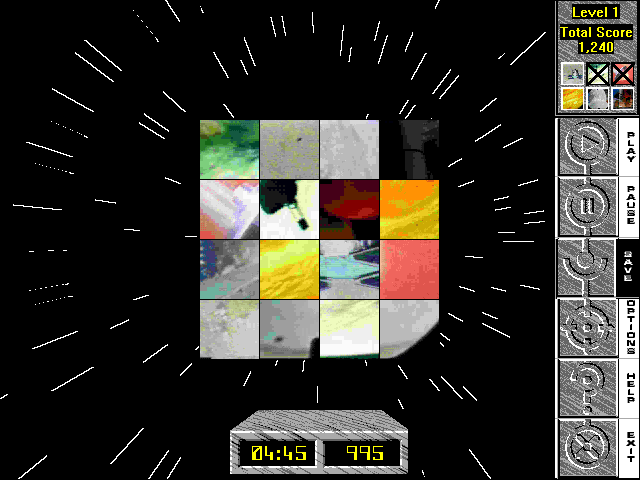 It’s an unavoidable failure: Video Cube is a game about video that mostly does not have video. 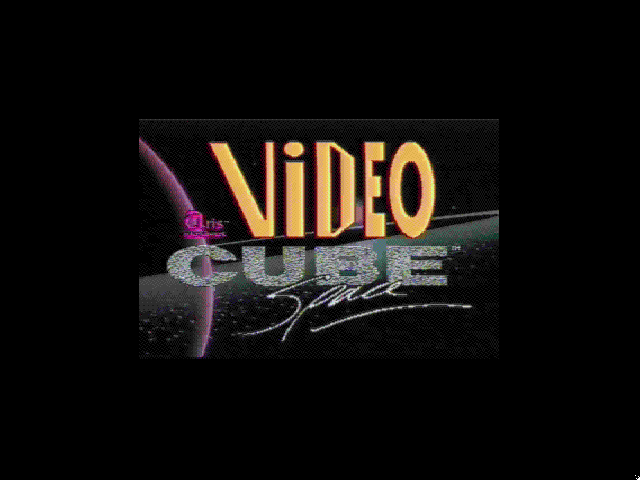 It’s a testament to the failure of the game that you’re mostly referring to it as “Video Cube”. It seems as though there were meant to be more Video Cube games, as evidenced by the Space subtitle. It’s almost as if you were meant to buy the Video Cube game whose theme appealed to you most (a simple comparison would be Nintendogs), rather than buy them as a serialized series of installments. Unfortunately, I don’t think scrounging up the resources to release multiple Video Cube titles at the outset instead of just Space would have saved the series. Either people would only buy the one or two games from your cornucopia of offerings that appealed to them, or they would play one Video Cube game, ravenously buy another, then feel gypped as they realized the Video Cube games were the same basic game with new videos. 1. Give in to the new-media, ADHD-esque call of variety. Don’t just use one theme of video per game, release one game with oodles of different kinds of videos that will appeal to everybody and make them excited about the CD-ROM format. 2. Add sound for at least some videos. I’m not sure if this would mean additional costs due to licensing or if Aris already was eating up licensing costs for VC: Space, but excerpts from a music video, the “I Have a Dream” speech, a TV show, or even just everyday things like a kid playing with a dog would wow people with what their computer can do. Of course, by the time videos with sound became viable, the Microsoft Home line (for general and cultural topics i.e. Encarta, Cinemania, Art Gallery) and the Dorling-Kindersley line (for specific and educational topics i.e. space, human body, the I Love series) were eating everybody’s lunch. Aris would have had to step it up from this simple minigame even if they had added sound. As an aside, I can’t find the specific quote I was going to quote, but it seems that the Microsoft Home line was basically a way for Microsoft to use their vast coffers to drive smaller companies out of the market during the ‘multimedia/edutainment CD-ROM” boom. It made for some great apps but it’s a little sad, isn’t it?